Poughkeepsie Grand Hotel is never tired of a Pretty in Pink Wedding! Looking for some Pink Inspiration for your next vent? Check out these details…Congratulations to MariaStella & Victor! 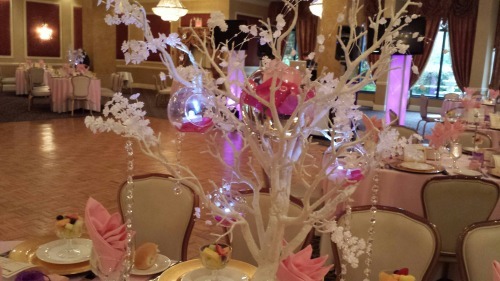 Your Pink Wedding Details made your reception so beautiful…White Tree Centerpieces with Glass Bowls of Pink Flowers & Candles, Gold Charges, Rose Petals, Crystals, Even a Pale Pink Wedding Gown!!! Planning a Hudson Valley Wedding? Want to book your special day with a venue that is up to date with all the current trends? Give us a call to Schedule Your Tour 845-485-5300!